The final destination on our tour of Villers-Bretonneaux can be found nestled among this small outcrop of trees and bushes a short distance south of the town (you can see the church spire on the horizon near the centre of the picture). …but today it simply stops here. …and a plaque, placed here by the inhabitants of Villers-Bretonneaux, remembering those of all nationalities who fell in the defence of their town. 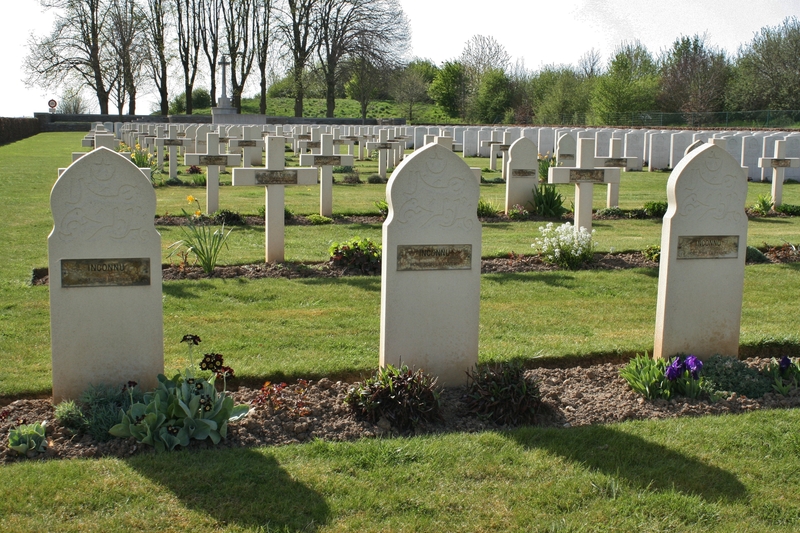 Unidentified Muslim graves, men from North Africa, among the French burials. 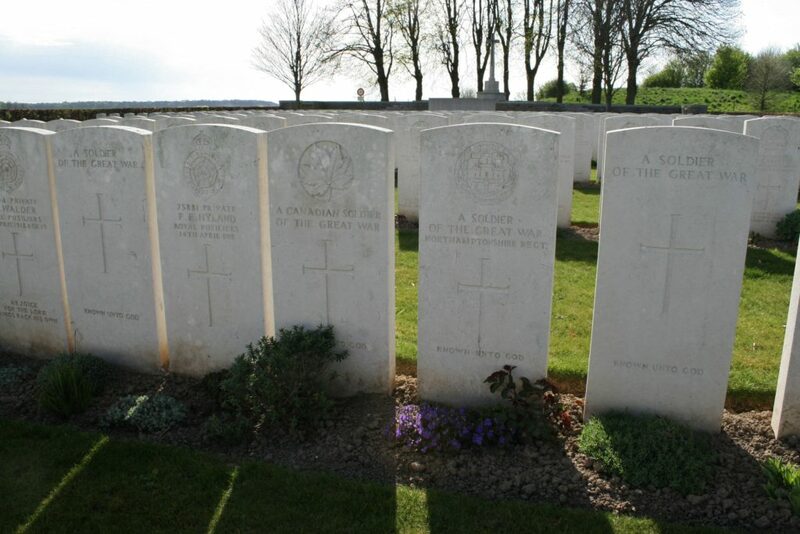 There are also two Russian Legionnaires buried among the French graves. By the summer of 1918 Canadian troops had been slotted into the line between the Australians to the north of Villers-Bretonneaux and the French Army a little further south. The Battle of Amiens (or, as the French referred to it, the Third Battle of Picardy) began on 8th August 1918, the opening phase of what became known as the Hundred Days Offensive that would eventually lead to the Armistice in November. 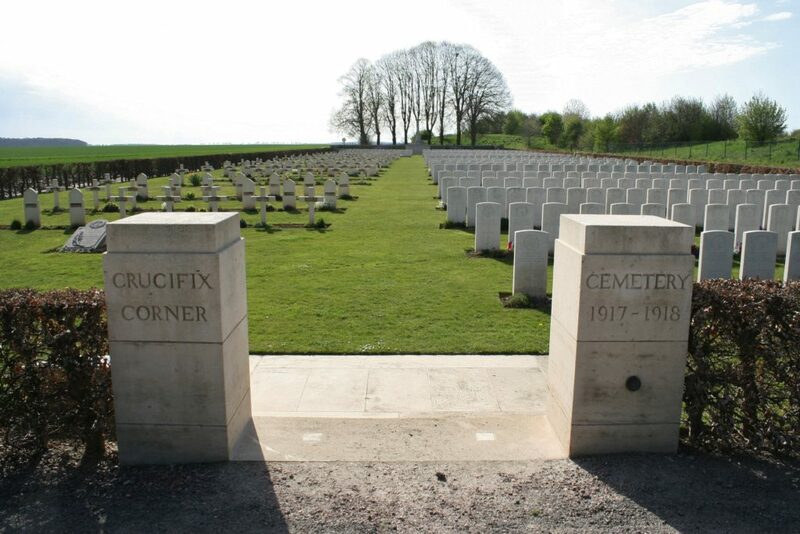 The first day of the battle saw an Allied advance of a remarkable seven miles, and it was the Canadians who began Crucifix Corner Cemetery, burying getting on for 100 men here who were killed during the first day’s fighting, all in the four rows in the shot above. And, with the front lines, after just a single day of battle, already so much farther east, the cemetery was effectively closed the same, or the following, day (circumstances may well have dictated that these men were not buried until the day after their deaths, but they would certainly have been buried as swiftly as possible). 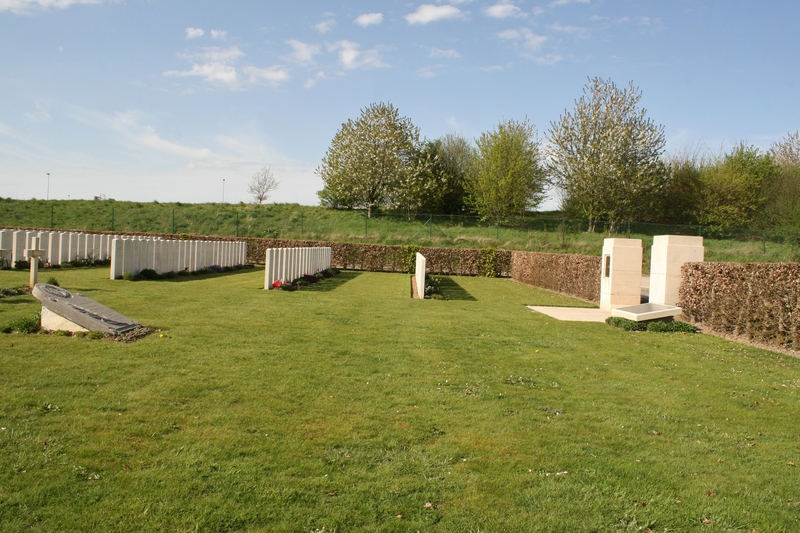 …241 French graves, along with sixteen Americans and ten Germans, were removed from the cemetery to be reburied elsewhere. 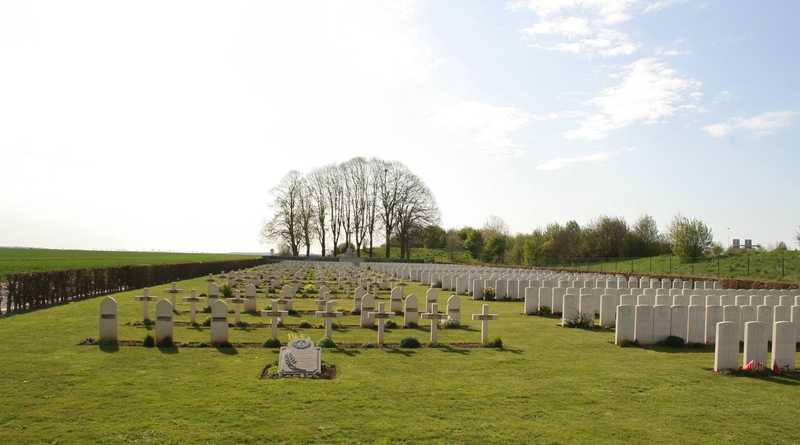 141 French graves still remain here today, however, I believe to eternally symbolise the efforts of both the French & British armies in jointly halting the attacking Germans here at Villers-Bretonneaux in April 1918. 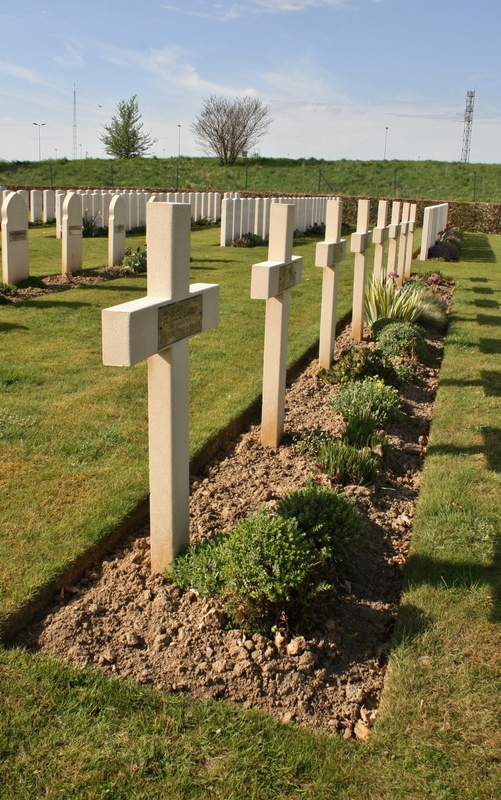 Beyond the four French Plots, towards the western end of the cemetery, we find Plot X, a single plot of post-war burials, at which point you might as well have a look at the cemetery plan, thanks as always to the CWGC. Panning to our right, across the cemetery, Plot IX, again post-war reinterments. After the war the cemetery was greatly enlarged as many more men were brought in from the battlefields, and from a single burial ground in Vaire-Sous-Corbie, north of Villers-Bretonneaux, where 27 soldiers, all but one Australian, had been buried in July & August 1918. 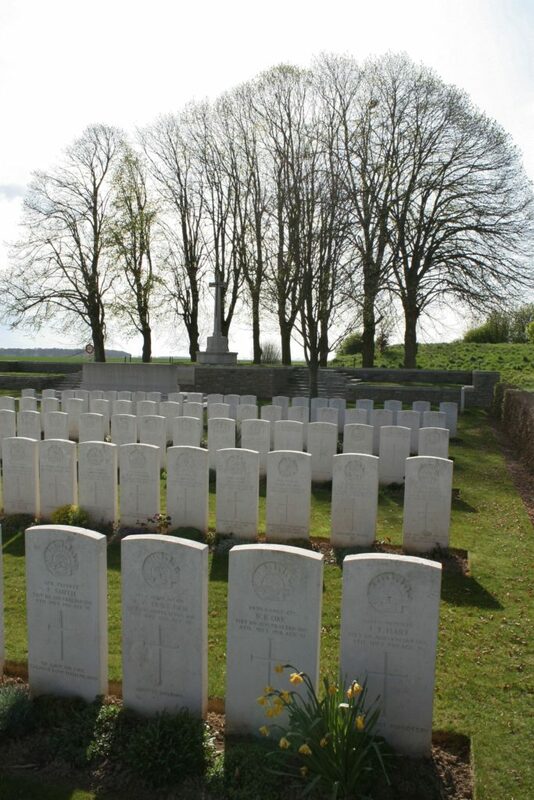 Many of the Australian casualties in this picture bear the date of death of 4th July 1918, as do 67 men in total now buried in the cemetery, more than half of them in Plot IX, and all casualties of the Battle of Hamel, where Australian & American troops, supported by British tanks, successfully captured the town. 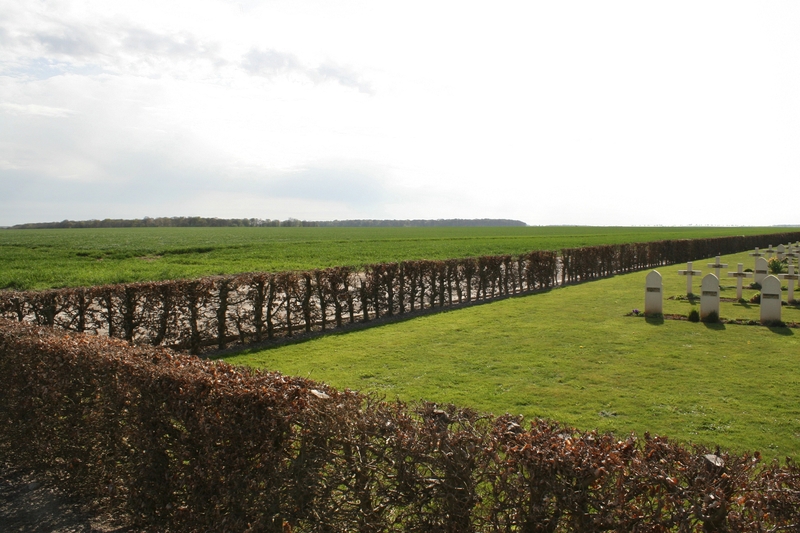 Around 1,400 Allied troops became casualties that day, including 176 Americans of whom a small number were killed (I wonder whether the 16 Americans originally buried here were their dead from the Hamel battle?). The Australians suffered some 800 dead, and 13 members of the British tank crews were also killed or wounded. German casualties amounted to perhaps 2000 killed and 1,500 captured, the Allies also succeeding in recapturing a considerable amount of British equipment taken by the Germans in April 1918. 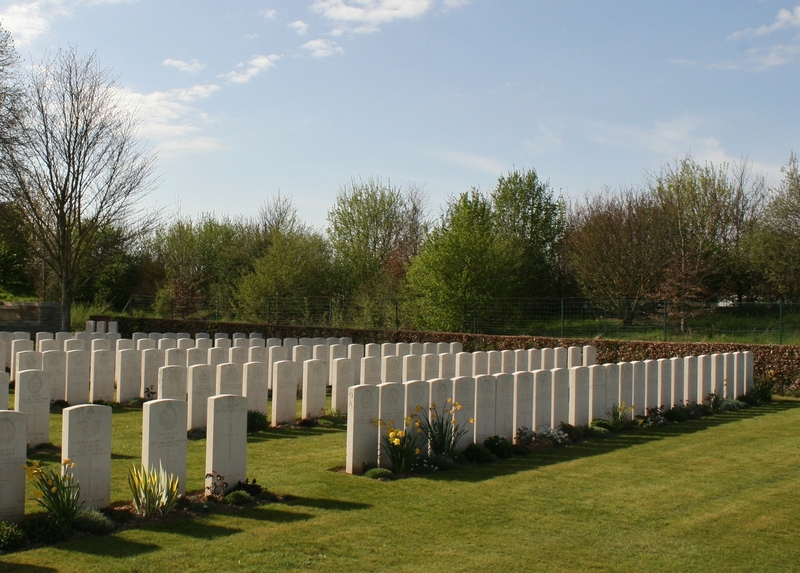 There are also 92 men now buried here who died during the fighting on 24th & 25th April 1918 (including a Second Lieutenant of the Tank Corps). 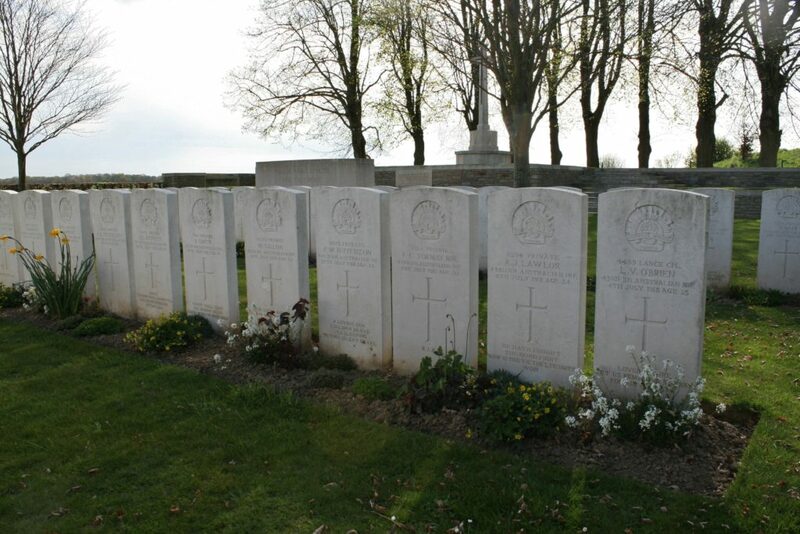 660 Australian, British & Canadian casualties are buried in the cemetery, nearly 200 of whom are unidentified. 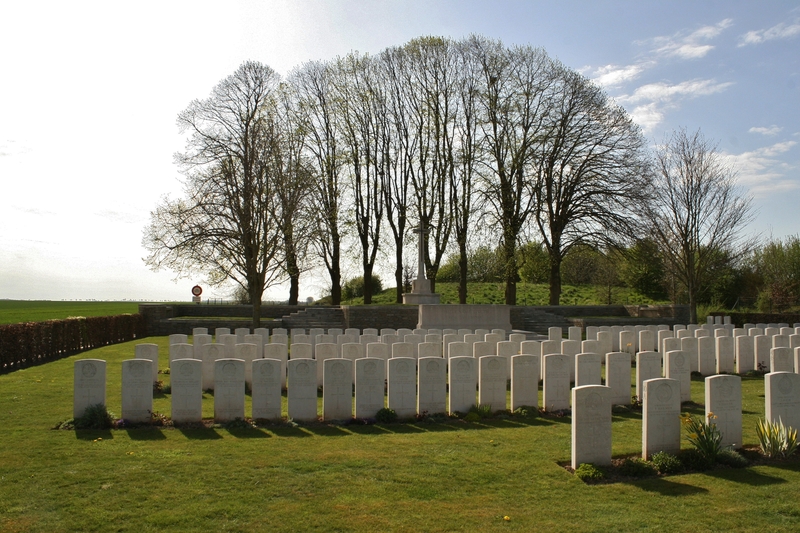 Looking due east across the cemetery, the main road to Villers-Bretonneaux crossing the A29, the quickest route between Amiens & St. Quentin, in the left background. 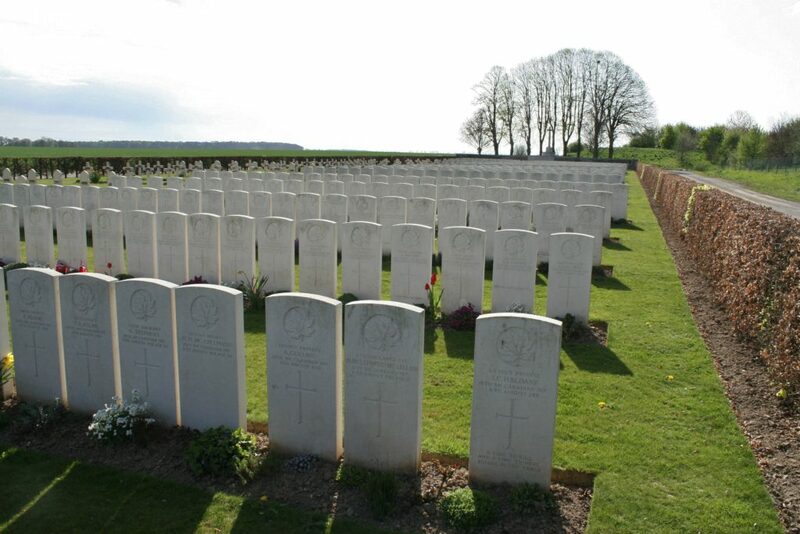 But it is what occurred on 24th April 1918 in the fields to the west and north west of the cemetery that we shall be concentrating on throughout the remainder of this post. The first tank versus tank battle in history took place south of the Roman road that runs straight through Villers-Bretonneaux, in the fields beyond this cemetery, between a single German A7V tank, and three British Mark IV tanks, later (and often referred to as a separate action) supported by seven of the smaller Whippet tanks. It’s a curious thing, bearing in mind the Blitzkrieg tactics of twenty years later, how few resources the Germans put into armoured fighting vehicles during the Great War. They produced a grand total of twenty two tanks, including the prototype, all of one type, compared with not far off 8,000 of various designs produced by the Allies, although the Germans did also use a fair number of captured British tanks in 1918. 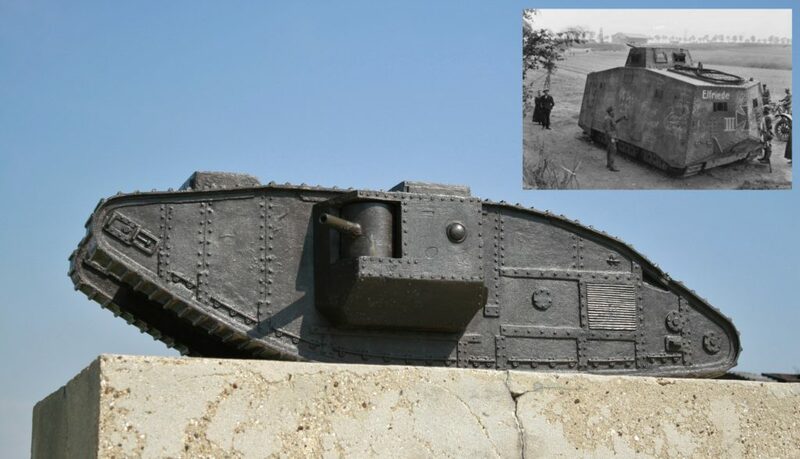 The first British tank attack took place during the Battle of Flers-Courcelette on 25th September 1916, 32 tanks attempting to engage the Germans, nine of whom succeeded in reaching the German trenches, the French first used tanks on 16th April 1917 during the Nivelle Offensive, and yet the first time the Germans employed tanks was a late as 21st March 1918. 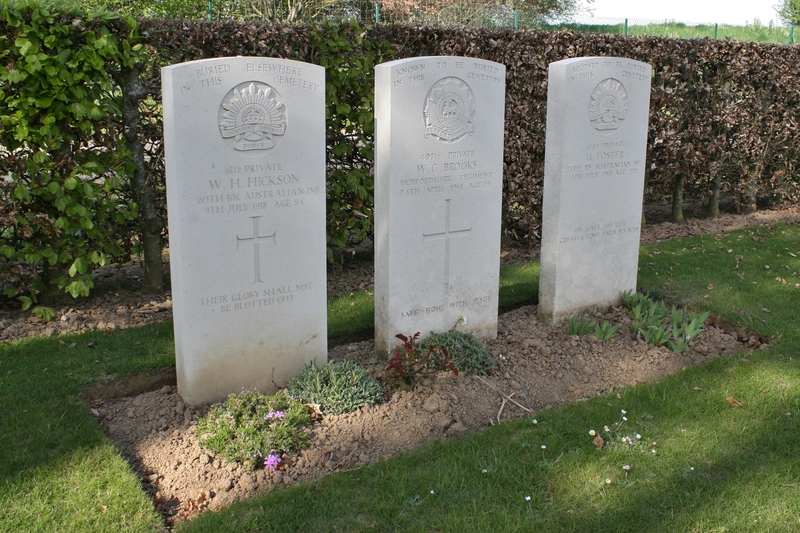 Three special memorials, visible on the left in the previous picture, to men, from left, ‘buried elsewhere’, ‘known’ & ‘believed to be buried in this cemetery’. 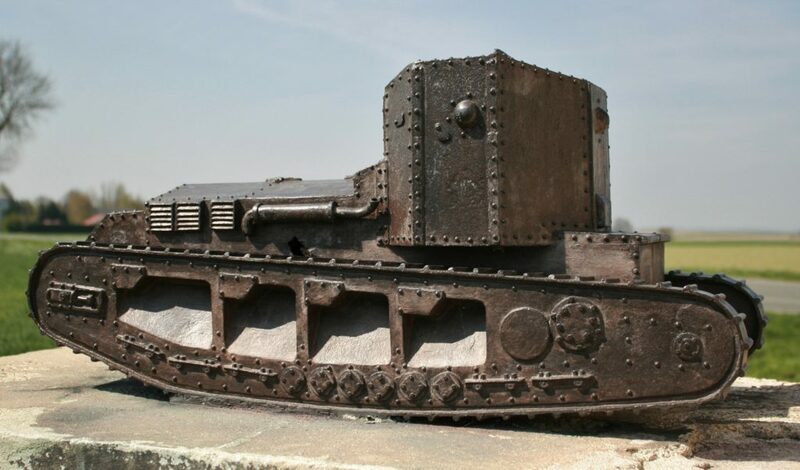 The German A7V tanks (‘Elfriede’, inset above, after capture by the French) weighed upwards of 30 tons, were 24 feet long and ten feet wide, more than ten feet tall, and had a top speed of ten miles an hour. They had a minimum crew of eighteen, and were armed with one 6-pounder gun in the bow, and six 7.9mm machine guns positioned around the hull. The British Mark IV tank (above) had a crew of seven or eight, weighed a few tons less than its German counterpart, and was slightly longer, a good few feet wider, and was itself more than eight feet high, which surprised me – I always considered the A7Vs to be much taller than the British tanks. The Female tanks carried two .303 machine guns in each of the sponsons, the Males a 6-pounder gun and a .303 machine gun in each sponson, and both had another .303 machine gun firing forward. Top speed was a staggering four miles per hour. The British Medium Mark A Whippet weighed 14 tons, was 20 feet long, nearly 9 feet wide and 9 feet high. It had a crew of three, four .303 machine guns and a top speed of a little more than 8 miles per hour. British tank photos taken at the Tank Corps Memorial at Pozières. 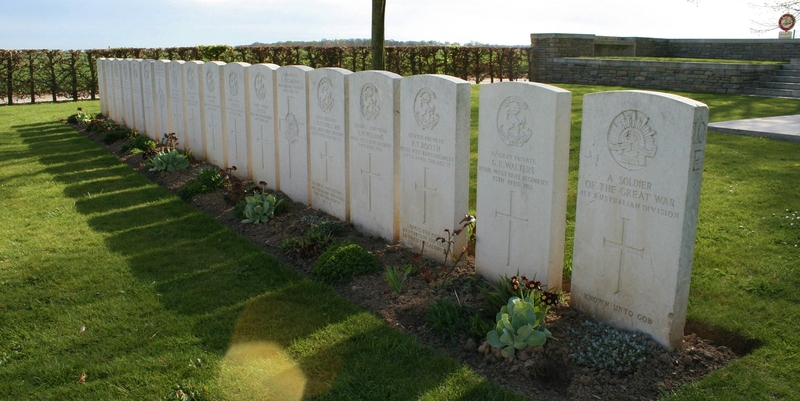 Australian burials in Plot IX Row D, including more men killed at Hamel on 4th July 1918. 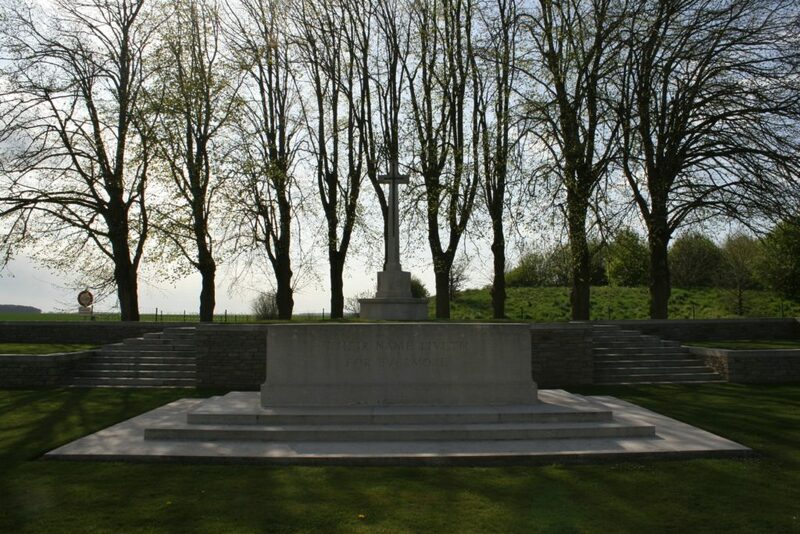 On the night of 23rd/24th April 1918 the Germans unleashed a fierce bombardment on Villers-Betonneaux, smothering the whole area with mustard gas and high explosive shells. 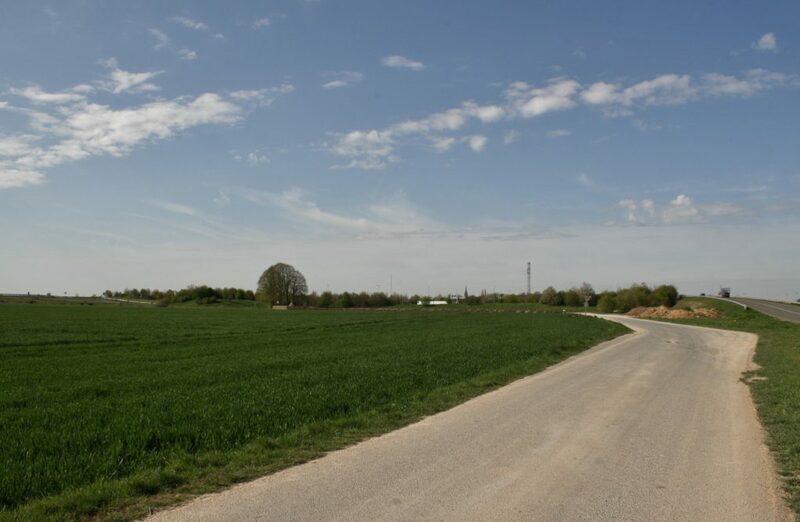 When they attacked out of the smog, supported by thirteen of their A7V tanks (the largest German tank attack of the war), at 7.00 a.m., the startled defenders of the already-depleted British 8th Division were unable to withstand the assault and were forced to retreat to the fields to the west of the town. German artillery then turned its attention to the woods to the immediate south of the Roman road, where German reconnaissance planes had reported seeing British artillery and tanks. In the woods, many of the tank crews had been affected by the gas bombardment, some to the point of incapacitation. Nonetheless, around noon, the remaining men clambered into their vehicles and the three Mark IVs, one Male and two Female, trundled out of the woods to meet the enemy. 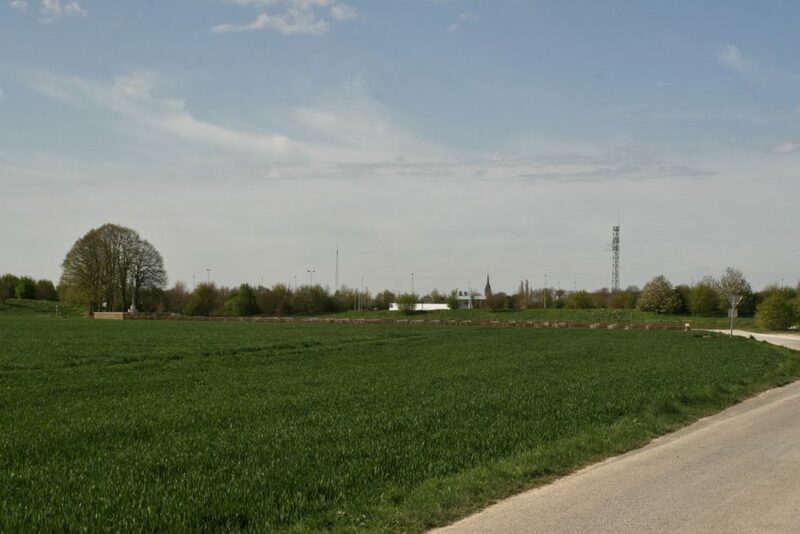 They were faced by waves of German infantry and three of the A7V tanks, the closest of which was only some three hundred yards away, making for the hamlet of Cachy, almost due west of where Crucifix Corner Cemetery now stands. Ordered to zig-zag by its commander, Lieutenant Frank Mitchell, the lead British tank, the only Male and therefore the only one armed with a 6-pounder gun, then opened fire on ‘Nixe’, the lead German tank (like the British, the Germans gave their tanks names), but failed to score a hit. ‘Nixe’, however, had spotted the three British tanks and immediately returned fire on all three, its own 6-pounder gun before long disabling both Female Mark IVs, whose machine guns and armour were no match for the German tank. Mitchell, one of his machine-gunners by now wounded in both legs by the red hot splinters of metal that the Germans’ armour piercing bullets caused to fly about inside the tank, halted his Mark IV, the occupants of ‘Nixe’ assuming they had managed to disable it. Mitchell, in actual fact, had halted his tank to give his gunner a stable platform from which to fire, and his gunner did not let him down, one round from Mitchell’s tank hitting ‘Nixe’ on the bow near the gun, killing the gunner, seriously wounding two more of the crew, and injuring a further three. Fearing the tank’s ammunition would explode, its crew abandoned it, Mitchell’s Mark IV scoring at least two more hits along its side before he turned his attention to the advancing German infantry and two more tanks, ‘Siegfried’ and ‘Schnuck’, approaching slowly with them. With the odds stacked against them, the British tank fired shot after shot at the approaching tanks which, incomprehensibly to the British, began to slow down, stop, and then retreat (perhaps the sight of the abandoned ‘Nixe’ on the battlefield helped in their decision). Which left Mitchell alone in No Man’s land not only facing the oncoming hordes of German infantry, but also the sole target for the German artillery. Frantically zig-zagging around the battlefield, Mitchell’s tank slid into a shellhole, its belly exposed, only the timely arrival of the seven Whippet tanks saving the day as they poured fire into the German infantry which retreated, allowing Mitchell to restart his tank and escape the shellhole. All eight tanks then began advancing towards the Germans, who opened up on them with 77-mm field guns, Mitchell exchanging furious fire with the German tank ‘Siegfried’ before an artillery shell ripped into one of the Mark IVs tracks, the tank now only able to turn in circles, a prudent Mitchell*, soon to gain a M.C. for his actions, and crew abandoning the tank for the safety of the nearest British trench. Behind, four shattered Whippet tanks burned fiercely on the battlefield. *Mitchell’s tank was later salvaged by the British. 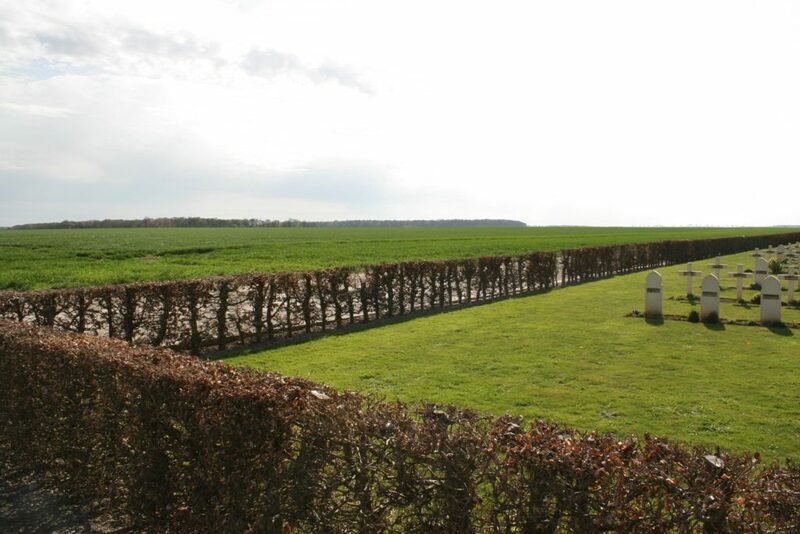 By the end of the day, in these fields to the south of Viller-Bretonneaux on the Somme, three British Mark IVs and four Whippets lay abandoned on the battlefield. The crew of ‘Nixe’, once it was clear the tank was not about to blow up, had remounted and managed to drive it more than a mile back through the German lines before an oil leak caused it to stop once more. Two German tanks to the north of the Roman Road, ‘Mephisto’ & ‘Elfriede’, lay abandoned in, respectively, a shellhole and a sand pit, the Australian & British counterattack that night preventing their recovery by the Germans. ‘Elfriede’ was dragged away from the battlefield by the French in mid-May 1918, while ‘Mephisto’ was finally moved by the Australians in July, and can be seen to this day at the Queensland Museum in Brisbane, Australia, the only A7V to survive the war. Which brings us to the end of our look around Villers-Bretonneaux, not because there isn’t more to see, but because that was all the time we had. Until we revisit. Wonderful photos and stories. I must come see these places one day. Thanks Steve. Good fun researching this one, too. I learnt a lot of detail I was unsure of, believe me. 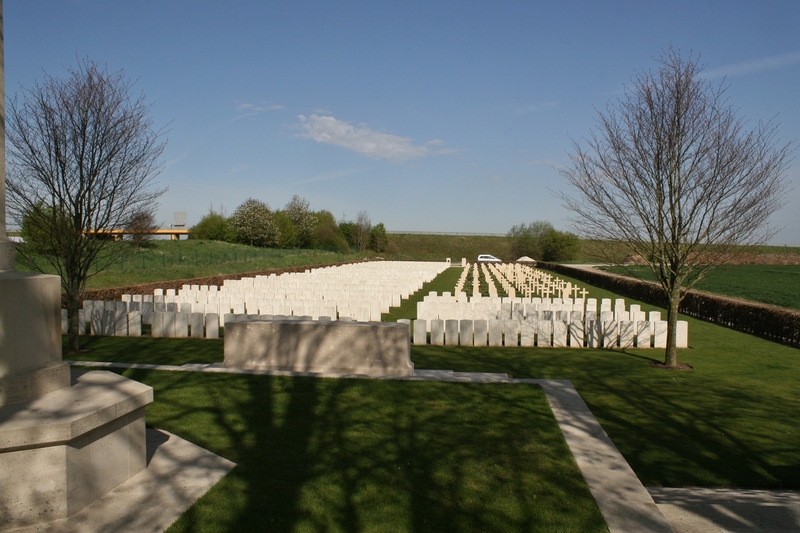 And visiting Villers-Bretonneaux was a treat (Baldrick & I went there one afternoon during our Amiens trip when the ladies went shopping) – the Somme is not just about 1916, as I hope I’ve showed with these posts. You have to see these places. Thank you for this detailed history of the cemetery. I visited here on 5 October this year during a battlefields tour which included a centenary service at Montbrehain, the site of the last battle fought by the AIF and where the last Australian VC of the war was won. 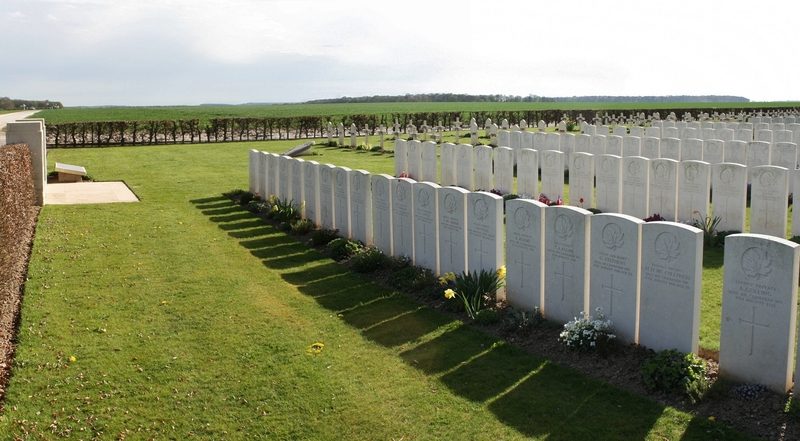 My partner’s great uncle (2903 Pte Oscar Hyles 60th Battalion AIF is buried in Plot V C 17. The 60th Battalion was involved in stemming the German offensive in the Corbie area and on 25 April 1918, Oscar took part in the 15th Brigade’s famous capture of Villers-Bretonneux. 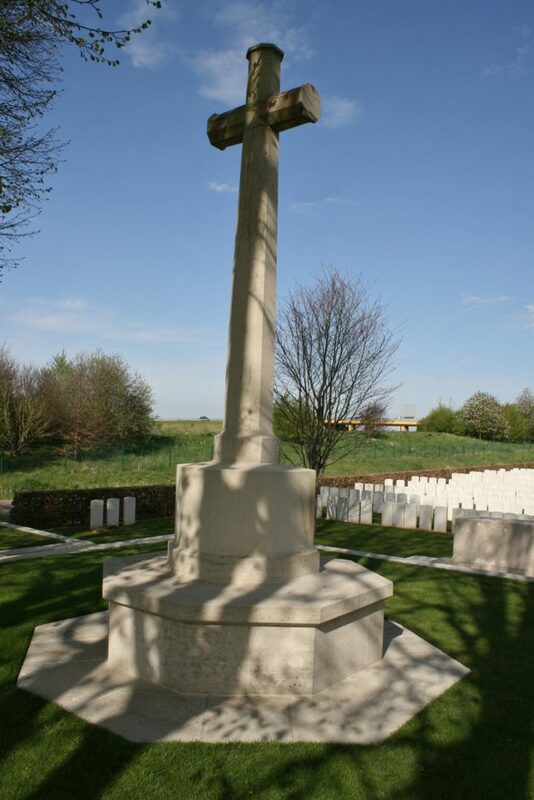 The following day (26 April) Oscar and another man in his Lewis gun team were resting in a dugout in a reserve trench forward of Villers-Bretonneux. When a German artillery bombardment began, a shell hit the dugout, killing Oscar and his comrade instantly. Oscar was 29 years old. He was buried near where he was killed, but after the war his remains were exhumed and reinterred in Crucifix Corner Cemetery. Sadly, Oscar’s younger brother 2910 Pte Elliott Hyles (aged 20) also of the 60th Battalion AIF was killed at Polygon Wood on 26 September 1917. 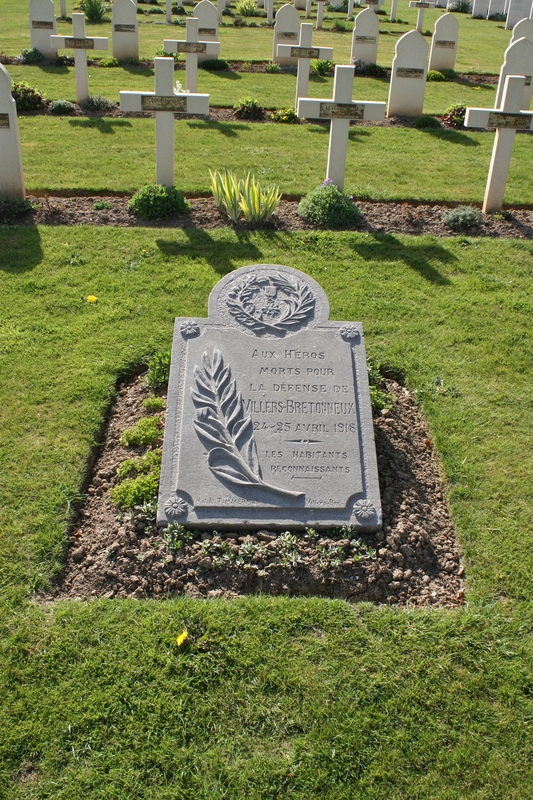 He was buried near Zillebeke but after the war, his remains could not be identified and his name was added to the Menin Gate Memorial. The two boys left behind 5 sisters to continue running the family sheep property “Woodglen” near Adaminaby, NSW, Australia with their parents. As the sisters have all now passed away the property has been taken over by the owners of the adjoining property and it still runs sheep today. And thank you for taking the time to comment so fully Frank. Very interesting stuff, and much appreciated. And you were not the only reader of this site who was at Montbrehain recently.